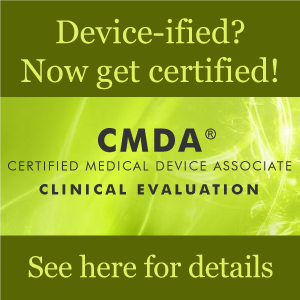 WMDO has setup the first level certification exam for medical device clinical professionals leading to a diploma of CMDA – Clinical Evaluation. This is the first certification exam for clinical research associates or similar positions within the industry, hospitals or regulatory agencies focusing on the medical device requirements and methodologies. Additional locations can be setup upon demand provided a minimum of 8 participants. The subscription to the examination can be done online click here. "Dramatically improves knowledge about medical device processes and regulations and I particularly appreciated the interactivity of the courses which made it easy to understand the content"
"Excellent information, well done and easy to use. The resource documents were a good help for continued reading"
"I would love to take more of these courses. The instructor was very knowledgeable and did a great job of presenting the subject. To be strongly recommended"
"I am impressed by the quality of the online trainings which cover a large area of expertise. The pricing is fair and the content is concise & to-the-point, giving real life examples and suggestions for implementation. In addition, the premium account gives subscribers the feature to reach out to SME’s with possible questions and comments"
"WMDO’s professional online device training meets our needs while adding value to our company. Benefits to our staff include 24/7 access to the diverse course catalog, comprehensive training material, and no travel expenses. In today’s virtual world, using WMDO as our primary training program provides a practical solution for continuing education." "I love your program it is helping me tremendously with my job as a CRA. I have been with the company for 3 years but pretty much hit the ground running with little or no time for training. Your courses reference case studies from many different therapeutic areas which improves my overall understanding since my area of expertise is Ophthalmology. This program allows me to work at my own pace giving the courses my full attention which allows me to learn more information"
"I had a very good experience with WMDO. The presentations were very clear and well structured. I further very much appreciate the quick contact and help we could always get when there were questions or discussions between CRA’s or questions from sites we couldn’t sufficiently answer."